Kyle and I went back to high school today, which is something I swore I'd never do! However, today's visit did not include math homework, pickleball in PE or English essays. So, I agreed to go. After all, this visit was all about Grace. Kyle, Grace and I went back to school to talk to students at Morrisonville High School. Several weeks ago, Janet Walch of Raymond, a science teacher at Morrisonville High School, contacted Kyle to share with him that she and her students were studying genetics. 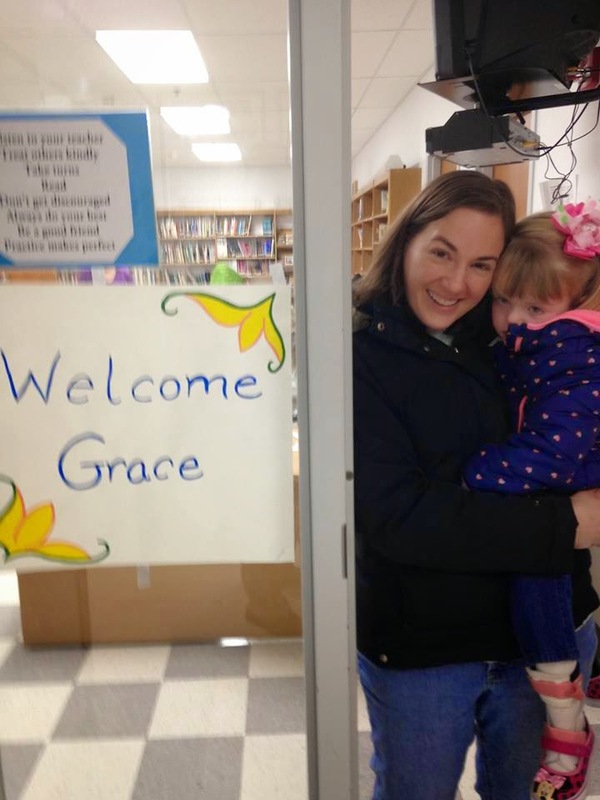 She had been talking to the students about Grace's diagnosis and asked if she could share Grace's photo with the class. Kyle responded that we could do her one better, we would bring Grace to meet her students in person. It took a little finagling with snow days and legal holidays, but we scheduled a visit on Monday, Feb. 23. Kyle is talking to the students, and Grace is charming the crowd, as usual. It was a great day to go back to school, and I have to admit, we even arrived early! That's quite a feat for those that know us (and Grace's preschool teachers should probably not count on it for future days). But since we were a few minutes early, Janet took us to meet some seventh and eighth grade students who had been collecting money for the INAD study. They presented us with a canister that had Grace's photo on the front, and Grace even gave them one of her biggest smiles. Just by themselves, the middle school students raised over $100 for the study. We are so truly blessed. Then it was time to meet the high schoolers to share Grace's story. Since several classes of students were interested, they set up the library for our visit. Grace had the place of honor, a big green bean bag chair on top of a table. She sat there the entire time enjoying the treats the kids had for her, and I have to say she relished being the center of attention. Grace got a huge MInnie Mouse bag with new baby dolls, Smarties, suckers and a singing Minnie Mouse microphone that was her favorite. Grace was thrilled to be part of the presentation today, and especially loved her new Minnie Mouse microphone. After all the students came in, Kyle and I had the chance to share our story from the very beginning, talking about different doctors, genetic testing and therapies. The kids were very attentive and asked lots of really good questions. 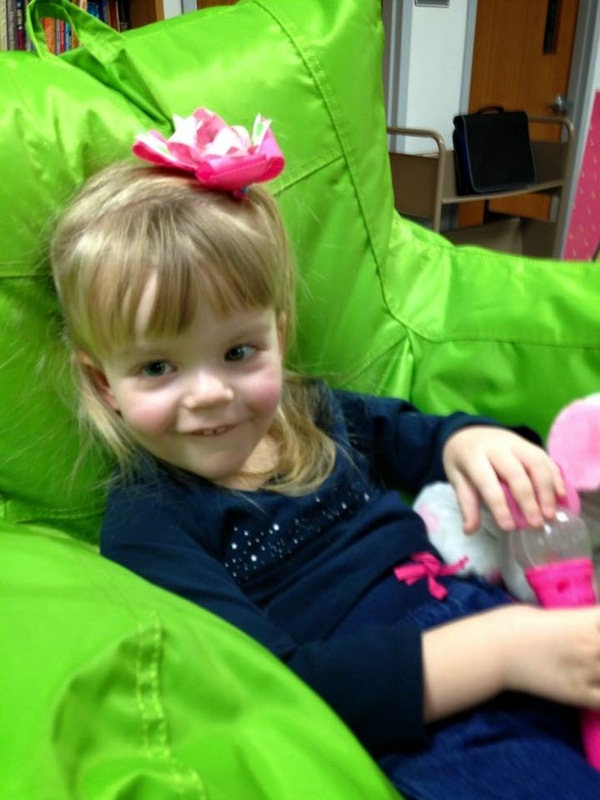 They have been researching INAD, and really knew a lot about Grace's diagnosis. Most of all, they were excited to meet Grace. After talking to the students, we posed with them for a group photo, and Grace absolutely loved when the kids came over to talk to her. She just smiled and smiled. And we made sure that all the students had their own "Gracelets." And to top off an awesome morning, the Morrisonville High School students and staff had also collected funds for the INAD study. The sophomore class donated $200 and the juniors and seniors each donated $150. From the junior high to the high school, they contributed nearly $950. Talk about amazing. We were welcomed to the library by this beautiful sign. We were so honored the students and teachers wanted to share in our "Grace Filled Journey," and hope we have the chance to go back again sometime. I just read all the stories to Mom because it is our night together. We are so inspired by all the love and support that Gracie and her family are receiving on this journey. I know this puts a smile on all your faces. I keep thinking how truly blessed we are as a family and look forward to the next step of the journey.